Spring is Here (I think)! The birds are chirping the flowers are blooming, and spring is finally here (I think). Last week we had a blast of winter weather and we are supposed to be in the 30’s tonight. But after that, it is supposed to be consistently in the 60’s and 70’s for spring! 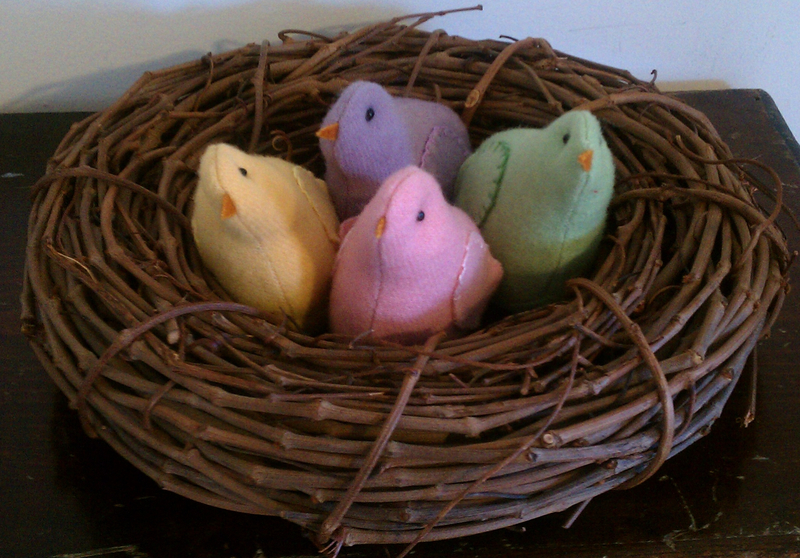 Here’s a cute spring project – a nest of Easter Peeps! The original pattern from Liberty Rose was a much larger chick that could be used for a pincushion. I downsized it and stitched it up in some yummy spring colors! You could also make some cute Easter Rabbits and use brown floss to add in the distinctive Rabbit Peep face – 2 small dots for the eyes and one for the nose (note: writing this on my to do list). This spring pillows were also inspired by Liberty Rose! 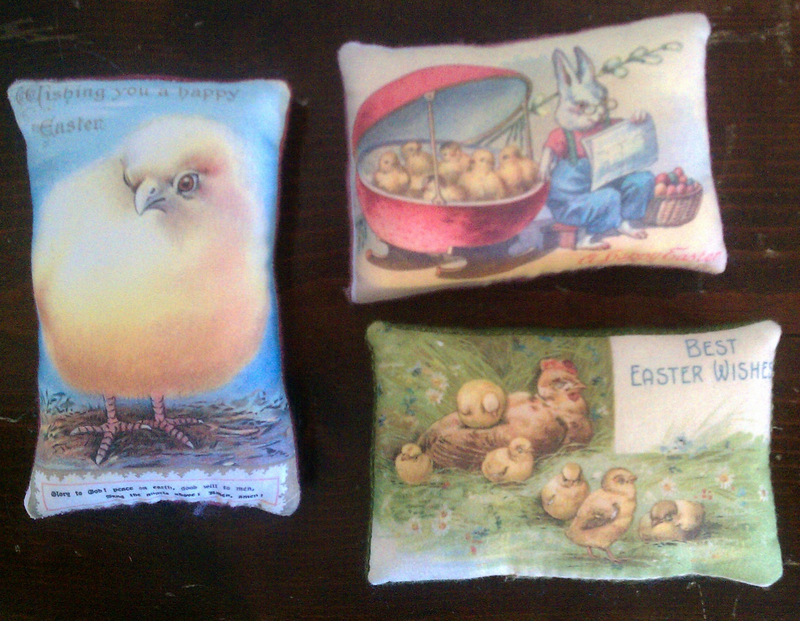 These are really easy to stitch up and are great accents for your spring decorating. Pick out a few vintage images (we used postcards) and then transfer them to fabric. You can buy the photo transfer fabric at Jo-Ann’s (bring your coupon). Cut out, sew on a backing, and stuff – viola! The neat thing about this is that you can use any image – there are lots of goods ones the internet, just do a search for “vintage ____ images”. Happy spring and Keep It Thimble! This entry was posted in Dolls and Softies, Holidays, Pincushions, Sewing, Wool. Bookmark the permalink. love the nest of peeps; too cute!!! The pillows are perfect for spring!!!! I think you will need a room in your home just to store your seasonal items. You have created so many cute items. 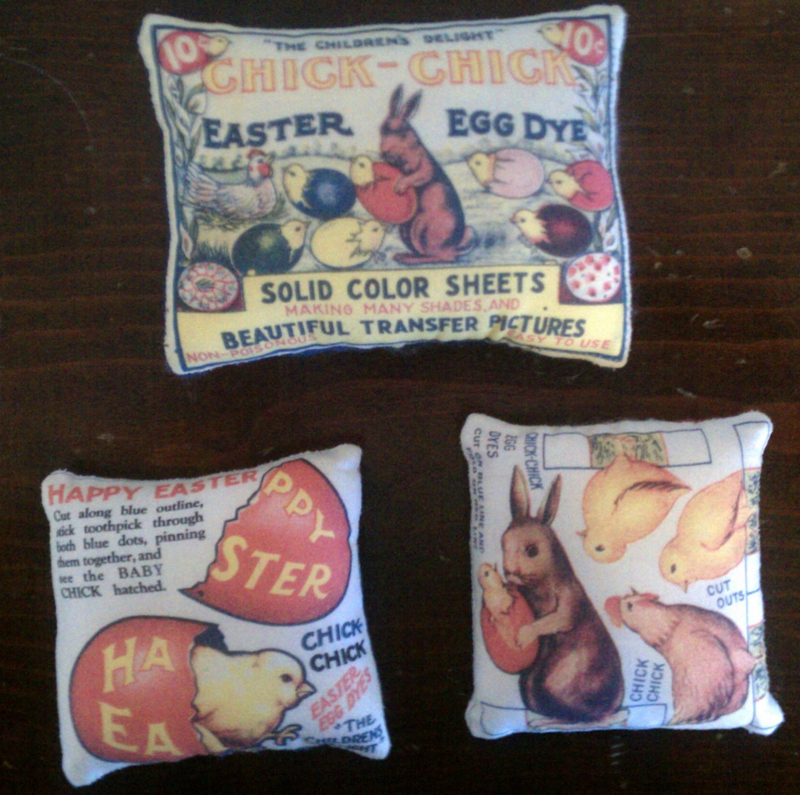 I can remember some of the pillow transfers from when I was a little girl. Yes, I do need a special room for this! I need to start selling some of the my stuff, but it’s hard to part with it.